Mountain Mayhem 2013 - The reprise of my 24 hour solo career. 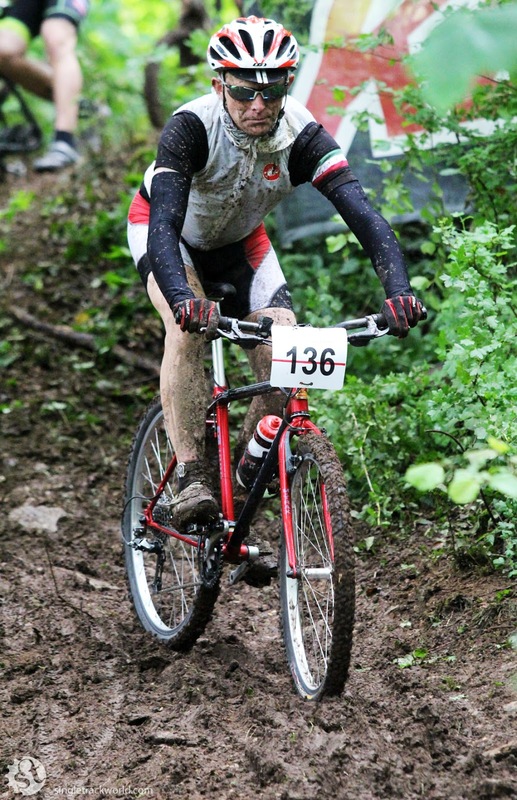 Six years ago at Mountain Mayhem was the last time I completed a 24 hour mountain bike event as a soloist. I attempted a second one that year, but packed after 12 hours due to the conditions. I vowed never to do another. 2013 and a brand new venue is announced for Mountain Mayhem. I had a good few road miles in the legs and was feeling quite fit. So I put my entry in as a soloist. I can't recall exactly why, as I didn't even own a mountain bike anymore, but that was a small detail. Via eBay and STW classifieds I source two bikes. A 94/95 Raleigh M-Trax for £75 and a Marin Palisades Trail for £100. I loan some XTR V brakes and controls from Nick Craig for the Raleigh, and fit a pair of old Bombers to the Marin from my parts box. I had not one, but two "race" bikes. So Pro. Al at the Polocini Coffee Shop sorted me out with some Torq Energy supplies. James, Ann and the kids volunteered to be my support crew. I was good to go. After pitching our tent on the Friday afternoon, Tom, James (on their cyclo-cross bikes) and I go and do a lap of the Gatcombe Park circuit. The going is dusty. Ace. Saturday morning after a night of heavy rain showers the going is no longer dusty. Not quite the usual 24 hr "fit the skinny mud tyres", but the course is definitely going to be a bit more interesting than the afternoon before. 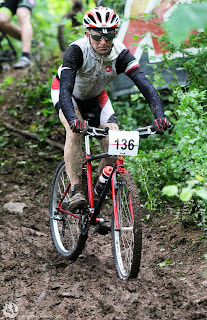 I watch people come back from their recce laps with their bikes covered in mud. 12 o'clock and we're off. A short run to spread the field a little as per, and then it's the usual go stop go first lap. I make sure as I do for the rest of the race that I take no risks, and stay well clear of any potential crashes. My crew look after feeding me and making sure I drink enough as the race goes on. All I have to do is ride, which bar a few hours when there seemed to be more walking than riding, was easy. I did have a couple of bad laps in the middle of the night, but Ibroprufen tablets and some Deep Heat gel seemed to straighten me out. I pushed on for a few laps as dawn came. I had lots of sore bits and pieces, but my legs were nowhere near done. As I neared the end I was well in the top 20 overall which had been my "if everything goes well" goal. I didn't do the extra lap I could have done, and instead rode the last lap with my friend Amy at a sociable pace. I was 4th Vet, and 16th out of 150ish soloists overall. Strava tells me that I spent nearly 4 hours faffing, which though on the day I said I'd never do another, tells me there is some room for improvement. Thanks to Ann, Skye, Tom, James, Nick and Al at Garage Bikes for the loan of a very bright Exposure light.